Some of the most successful theatrical comedies are those that take risks, and that is exactly what Sony Pictures has done with The Interview. If you were disappointed that Regal, AMC, Carmike, and other high profile movie theatre chains decided not to carry the film and Sony (parent company to Columbia Pictures) refrained from releasing it on DVD/BluRay, you can catch it on Google-Play. James Franco and Seth Rogen are a hilarious match with fantastic comedic chemistry. Is the movie irreverent? Yes. Is it offensive? Yes. Was it well structured, paced, have memorable characters you either love or love to hate, and well-acted? YES. In other words, this film is a very well executed comedy that, in the words of The Magic School Bus’s Ms. Frizzle, “takes chances, makes mistakes, and gets dirty!” Comedy is drama in disguise, and this concept is well played-out in this political comedy that will have you rolling in your seats and laughing out loud with your friends. The Interview is one part self-reflexive movie and two parts political, satirical comedy starring Seth Rogen as the veteran television producer Aaron Rappaport of the TMZ-ish talk show Skylark Tonight hosted by Dave Skylark played by James Franco. After receiving word that the Democratic People’s Republic of North Korea’s supreme leader Kim Jong-un is a huge fan of the show, Rappaport and Skylark decide to conduct the interview. Using this as an opportunity to assassinate the oppressive leader of North Korea, the CIA approaches the two media professionals with a plan to poison the reclusive leader in order to free the nation and protect the United States. Follow the uptight television producer and his eccentric host on an unexpected journey filled with espionage, intrigue, and laughter as Skylark prepares for his most important interview of his career that could have major repercussions in the world. Ordinarily, I am not a huge fan of comedies. However, every once in a while there comes a comedy that is well-executed all the way around. The Interview is the type of movie that will likely develop a cult following because of the simple fact that is was essentially kept from public exhibition, but it truly has a lot to offer. Furthermore, it is also excellent commentary on how to work through political upheaval and strife between nations. The self-reflexivity of the movie is evident in the production of the Skylark Tonight show because the audience gets a taste of what it is like for a national television show to prepare for a high profile interview of a country’s dictator. A little bit of the curtain is pulled to see how questions are developed and arranged, and how manipulating the format can have great implications for the results of an interview. Throughout the movie, there is so much satirical political comedy that it will be hard not to laugh. From the faux celebrity interviews to the master plan of the CIA, from the security guards to the supreme leader himself, this screenplay is filled with situations that are simply laughable. Not laughable in that there is no rhyme or reason to the plot, but for the reason that it is woven together in a manner that greatly supports the narrative. Timing of comedic content is key to a successful movie such as this one, and the writers did their job very well in laying out the jokes and humorous messes in which the characters find themselves. If you enjoy political satire or self-reflexive comedies, then this is a movie that you will undoubtedly enjoy. Much of the content is for mature audiences only, so it definitely isn’t the movie you play for family movie night. 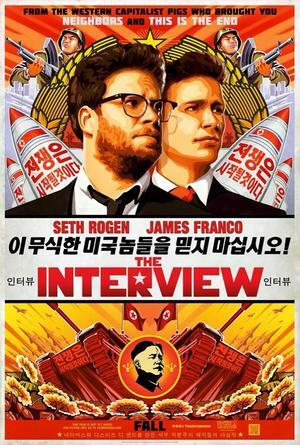 And yes, a large portion of the irreverent comedy is at the expense of Kim Jong-un, so it is of no surprise that Sony decided to release it online instead of in theaters. However, I feel it could have been a smash hit with audiences this festive season when so many are getting together with friends and family to enjoy the laughter that comes along with the holidays.